I've used Soft Suede, Bermuda Bay, Mint Macaron and So Saffron to put this card together. I love that it both pops with color and still somehow looks soft. The corrugated paper is terrific for adding texture to projects. I just love it! That little wooden heart you see next to the sentiment is left over from the Water Color Wishes card kit. 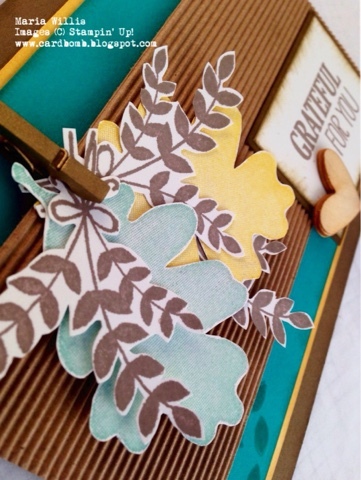 It's a fantastic kit and Stampin' Up! is generous enough to include extra embellishments in the kit. The little leaves that I stamped in the background are from one of the current hostess sets called Floral Wings. Here's what the whole For All Things stamp set looks like. I love that watercolor background stamp and the little watercolor banner too! I hope you'll head on over to What Will You Stamp to check out what the rest of the amazing Design Team has made this week. If you've got this set, I hope you'll join us for this week's challenge! I can't wait to see What Will You Stamp? !